Fly high with Poe Dameron! 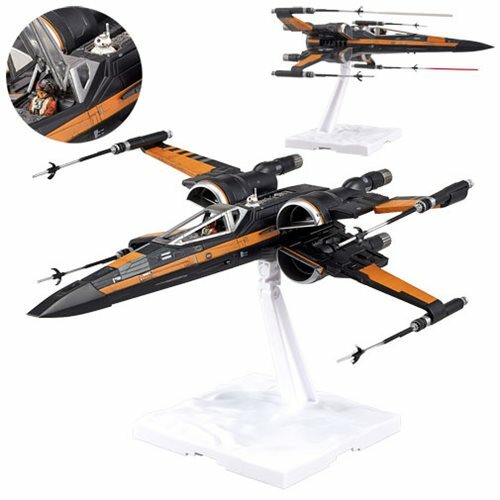 This super-high detail, color injection-molded plastic, 9-inch long kit of Poe Dameron's X-Wing fighter seen in Star Wars: The Force Awakens features opening and closing S-foils, 2 laser-effect parts that can attach to the wings, a cockpit with 2 different canopy options, a seated pilot(unpainted), BB-8, RO-H2, landing gears, a water-transfer decal, a marking sticker, and a dedicated display stand. No glue is required for this Star Wars: The Force Awakens Poe's X-Wing Fighter 1:72 Scale Model Kit, but a nipper or sprue cutter (sold separately) is needed for assembly. Ages 15 and up.